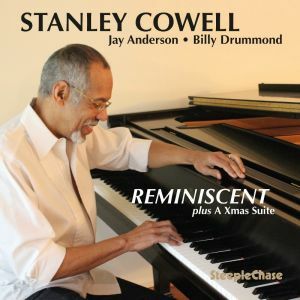 Jazz Piano Master Stanley Cowell Releases Best Holiday Genre CD of the Season 2015 - TheUrbanMusicScene.com | Music Reviews! The art of piano is all about touch. Over a fifty year career as a leader and sideman with the likes of Sonny Rolins, Stan Getz and Max Roach, Stanley Cowell has mastered an impeccable balance of intelligence and taste. The evidence is overflowing on the Maryland resident’s latest Danish import, Reminscent, a trio recording with bassist Jay Anderson and drummer Billy Drummond. The aura and the theme of the project are celebration with the centerpiece being a six part “Christmas Suite” that is a highlight of the 2015 season for the world of jazz. Following a lovely stand alone take on Thad Jones’ “A Child is Born” as its lead in, the suite moves from a bossa swing lilt on “It Came Upon a Midnight Clear,” a tranquil soul groove for “We Three Kings,” a spry skip through “Winter Wonderland,” a rollicking “Jingle Bells” and back for a slow fade finale of Cowell’s own “A Christmas Melody.” The 10-minute piece will bring a jazzy reprieve from all the faithful era-ingrained chestnuts for many years to come. Other highlights of Reminiscent include thoughtful arrangements of Brahms’ “Intermezzo” and Horace Silver’s “Peace,” a brilliant extension of Monk’s “Round Midnight” titled “Midnight Diversion” as well as an original composition by Stanley’s daughter, Sunny Cowell, titled “Hear with Me” which features Stanley playing the African thumb piano known as a kalimba for a song inspired by the togetherness of family.